Happy Holidays! 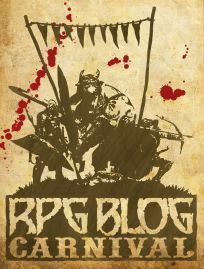 Get Those RPG Blog Carnival Entries In! Hey out there! This will be a shorter update since it’s the holiday season here in the United States and I’m on vacation. If you missed it, there’s a new fifth edition adventure for level 20 PCs called Happy Holidays on the Free Game Resources section of the site. Santa‘s gone crazy and it’s up to the PCs to figure out why and put an end to his gifting of exploding coal. The adventure is complete with easy-to-print maps that can be brought into any virtual table. Check out the adventure for level 20 PCs. Speaking of awesome homebrew content, it’s the theme of this month’s RPG Blog Carnival which is being hosted right here on this very blog for all of December. The exact theme is “Homebrew Holiday Gifts.” I’m asking bloggers everywhere to share their RPG creations for their favorite systems with me. At the end of the month I’ll make a list linking all participating blog posts so everyone can checkout the fine homebrew creations in one place. So get those entries in, friends! I can’t wait to see what you make. Oh shoot… we were supposed to figure out why he went crazy? Hahahaha. Nah! It’s all good! Happy New Year and Last Call for Homebrew Creations!